Are you a lady rider that is still rocking Nike’s on your bike? I know they look great, I have my fair share of Air Max’s, but they lack completely in protection. Actually, they usually don’t even stay on your feet if the unfortunate does happen. Luckily, Alpinestars has you covered with the Stella SMX 6 WP Boots and the Stella SMX 1 Boots. The Alpinestars Stella SMX 6 WP Boots has Alpinestars track level protection that can still be used during everyday life. They accomplish this by being comfortable, for a full height boot, and waterproof. 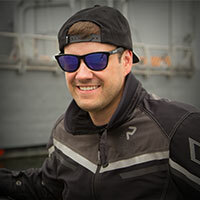 I personally used the SMX 5 boots in college and I had no problem walking across campus in them and the SMX 6 is just as comfortable with more protection! I also should mention that this boot is not just a smaller men’s boot but instead it was redesigned for an optimized women’s fit. 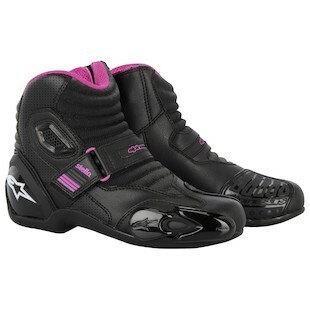 The Alpinestars Stella SMX 1 Boots are for the ladies that do not want to rock full height boots. 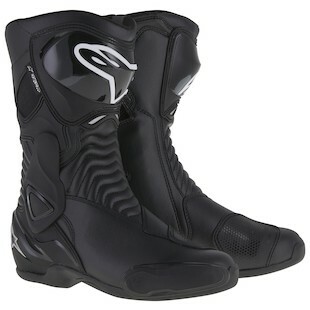 Alpinestars has essentially taking the lower half of the SMX 5 boots and cut off the top. This leaves you with ample protection for your feet while being as comfortable as you can get for an actual protective option. Truthfully speaking, when I was walking across campus in college, I wished I was rocking these boots. Like the Stella SMX 6, these are also designed specifically for a women’s fit and not just a smaller men’s shoe. Both of these options are great and I would recommend both of them! The one that is better for you will depend on your needs. When I was looking at these shoes in men’s, I decided on the full height boot since I do track days and that is what is required. However, if that wasn’t a necessity for me, I might of swayed the other way. One thing I do know for sure is these boots are going to be way better than your Nike’s!